"Nabucco" is known in English as Nebuchadnezzar. The libretto is based on biblical accounts in Jeremiah and the Book of Daniel. The opera was first performed at La Scala di Milano in 1842. This opera is considered the launching of Verdi's career, although it is not the first of his operas. His earlier works were ridiculed by a number of critics who considered Verdi un-tutored and inexperienced. Even Nabucco suffered some pans, but was nonetheless very successful with the public. Of particular note (pun intended) is the aria, va pensiero sull'ali dorate, meaning "Go, thought, on golden wings" which can be heard in this overture. It is also known as the Chorus of the Hebrew Slaves and is the Hebrew slaves' lament over the loss of their homeland. The opera is the story of the subjection of the Jews by the Babylonians. A Requiem, as many of you know, is a Mass for the Dead, and it is also known by that term. The Mass typically consists of two elements: the Ordinary and the Proper. All masses consist of the Ordinary, with five parts, Kyrie, Gloria, Credo, Sanctus, and Agnus Dei. For every day, there are also chants in the Proper, that is, chants for specific reasons. There are masses for every Sunday in the church calendar, but the Requiem is the only Mass which can be performed on any day of the year, for obvious reasons. All five parts of the Ordinary are sung in Latin, except for the Kyrie which is sung in Greek. This Requiem is not like the standard Catholic Mass. According to some biographers, Brahms was not known to believe in the life hereafter. His mass was to comfort the living, not to mourn for the dead or to assert their continued life in Heaven. Brahms had thought of writing a requiem for some time, possibly at the time of the death of his friend, Schumann, in 1856. He worked on the Requiem from 1857 to 1868. Perhaps the death of his mother in 1865 prodded him to finish the work. 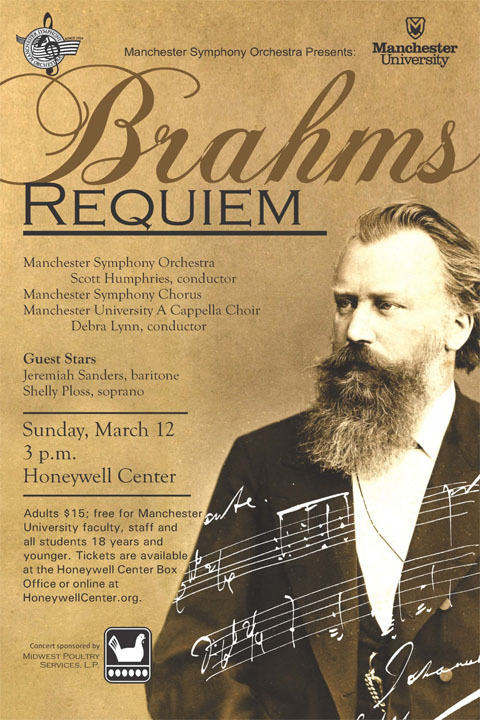 Unlike a typical mass, consisting of five sections, Brahms' consists of seven parts sung in German rather than in Latin. His argument was that as he had written it to console the living, in their grief, he wanted it to be understood by everyone. He chose the text from Martin Luther's translation of the Bible, both Old and New Testaments. The German Requiem broke with tradition in a number of ways. In addition to being in German, it combines a mixed chorus, solo voices, and full orchestra. The New Grove Dictionary of Music and Musicians describes this work as "not only Brahms' greatest vocal work, but also the central work of his career." is like the flowers of the grass. and the flower has fallen away. the early and later rain. and sorrow and sighing will have to depart. and that I must pass away. and my life is nothing before you. and yet they live so confidently. Now, Lord, in whom shall I find consolation? and no torment touches them. those who praise you forever more. and no one shall take your joy from you. and now I have found great comfort. zu der Zeit der letzen Posaune. Der Tod ist verschulngen in den Sieg. but we seek the one to come. at the time of the last trumpet. and we will be transformed. "Death is swallowed up in victory. Hell, where is your victory?" their being and are created. denn ihre Werke folgen ihnen nach. Shelley Ploss is an American operatic soprano, and graduate of the Jacobs School of Music at Indiana University. Ploss has performed such roles as Mimi in La Boheme, Princess Nicoletta in The Love for Three Oranges (Prokofiev) and the title role in Puccini's Suor Angelica. Recently Ms. Ploss has made a change from lyric soprano to dramatic coloratura, studying such roles as Königin der Nacht in Die Zauberflöte and Konstanze in Die Entführung aus dem Serail. While at IU, she studied with Metropolitan Opera baritone Timothy Noble, and Distinguished Professor of Voice Scharmal Schrock. Ploss also participated in Opera Workshop under the direction of world-class soprano Carol Vaness, and master classes with Nic Muni, James Marvel, and Virginia Zeani. 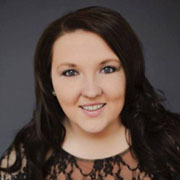 Ms. Ploss has been a Young Artist with La Musica Lirica, the Charley Creek Vocal Workshop, Opera Maya, and recently was a member of the Marcello Giordani Young Artist Program and the Crested Butte Music Festival. She is currently studying with Lynn Baker and Claudia Waite. Ms. Ploss is a native of Peru, Indiana, and holds a Bachelor of Arts in Music from Butler University along with her Masters in Music and Performance Diploma from IU. 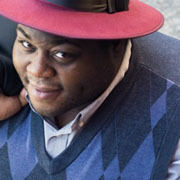 Jeremiah Marcèle Sanders, baritone, graduated from Manchester University in 2014, with a degree in voice and communications studies. Sanders is currently pursuing a Master of Music degree at Butler University. In 2016, Jeremiah was awarded an Encouragement Award at the prestigious Metropolitan Opera National Council Vocal Competition. He previously sang in Mexico with the San Miguel Institute of Bel Canto and in France. His previous roles include: the mischievous character Gianni Schicchi in Giacomo Puccini's Gianni Schicci, Aeneas in Dido and Aeneas, Sad in Tori Ovel's Now Boarding, and The Major General in Pirates of Penzance. He has studied with Kirsten Gunlogson, Thomas Studebaker, and Debra Lynn. His upcoming engagements include St. Peter in Butler Opera Theatre's production of Too Many Sopranos and his graduate voice recital. This summer he will work with Pittsburgh Festival Opera's productions of Richard Strauss' Intermezzo and the world premiere of A Gathering of the Sons. In addition to singing, Jeremiah is passionate about social justice, dance, and travel.